ATHY recently played host to a very successful Irish Sign Language festival. The event saw people from the deaf community gather together in Athy with members of the Kildare Deaf Group, students from the Trinity College Centre of Deaf Studies, the Deaf Village Ireland and of course the Athy community supporting the event. The weekend consisted of many different activities that allowed the Athy community to get a better understanding of Irish Sign Language. Local schools took a break from their usual class work to learn how to put Irish Sign Language into practice. Schools were provided with an Irish Sign Language booklet, which included basic signs to allow children to learn simple signs such as numbers for every day of the month, special occasions, sports and even the sign for chocolate!. The booklet also included charming professional caricature of the new Athy Library while the characters in the booklet are real caricatures of local students signing key words. On Saturday 29 September, attendees got the opportunity to attend a weather workshop presented by the RTÉ weather presenter Sarah Jane O’ Regan. Sarah Jane is deaf and presents the weather through sign language on RTÉ. Later in the day an art workshop presented by illustrator Ray Watson allowed adults and children to get doodling. Sunday was full of activities. Two booked out Irish Sign Language boat tours took place in association with Athy Boat Tours. An Irish Sign Language tour of the Athy Heritage Centre saw Seamus Taaffe give an interesting and lively guided tour about Shackleton. Following a lovely lunch in the delicious restaurants and cafes in town, a Sing and Sign Along Social with DJ Aoife McElwain allowed people to throw some shapes. Finally, as an end to the weekend’s activities everyone was treated to a bag of Choco Con Chocolates, inside of which was a card showing how to sign chocolate in Irish Sign Language. 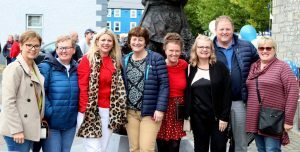 Maggie Owners, one of the organisers paid tribute to Kildare Co Council for the Creative Bursury Award which had helped make the festival happen; Athy Library, Athy Heritage Centre, Athy Boat Tours and all the people who came and supported our event.